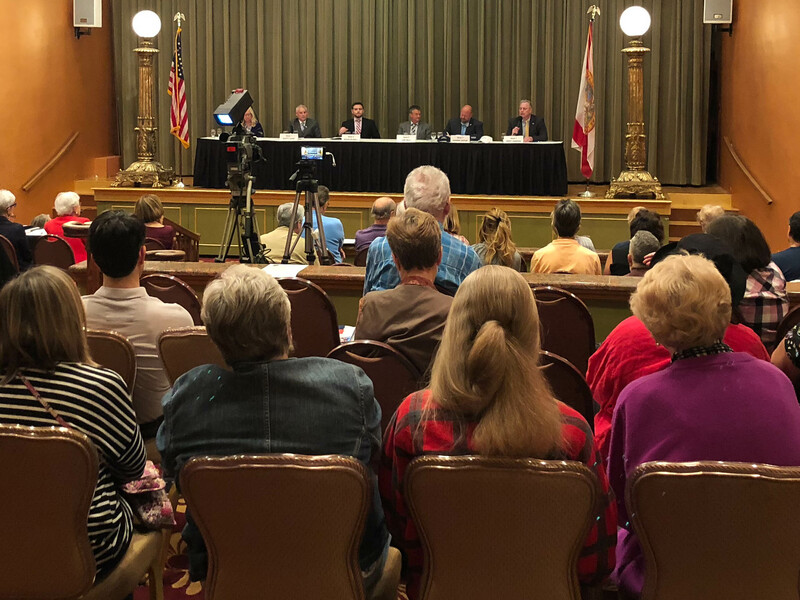 Two of the six 2018 Safety Harbor City Commission candidates spoke out about online bullying and bullish behavior during the candidate forum on Feb. 1. It’s a political tradition as old as the party system and bipartisan agreements—campaign wars. Whether it’s the race for the White House or a run for City Hall, election seasons are typically littered with innuendoes, accusations and other distasteful tactics employed by candidates and/or their supporters in hope they will provide an advantage over their opponents on Election Day. 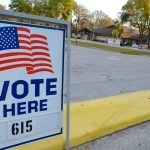 The City of Safety Harbor is no stranger to such antics, with at least two recent election seasons featuring campaign-sign stealing scandals, including one stemming from a televised undercover operation resulting in a lawsuit against the then-mayor, which was eventually dropped. This year, two of the six candidates vying for three open commission seats on Tuesday, March 13 expressed disdain for dirty campaign tactics, with Seat 3 hopeful Damon Lister calling for peace between all parties, during the candidate forum on Feb. 1. Seat 3 candidate Damon Lister. “I have zero tolerance, at all, for any harassment, any bullying, whether in person or online,” Lister said in response to a question about social media and online bullying. 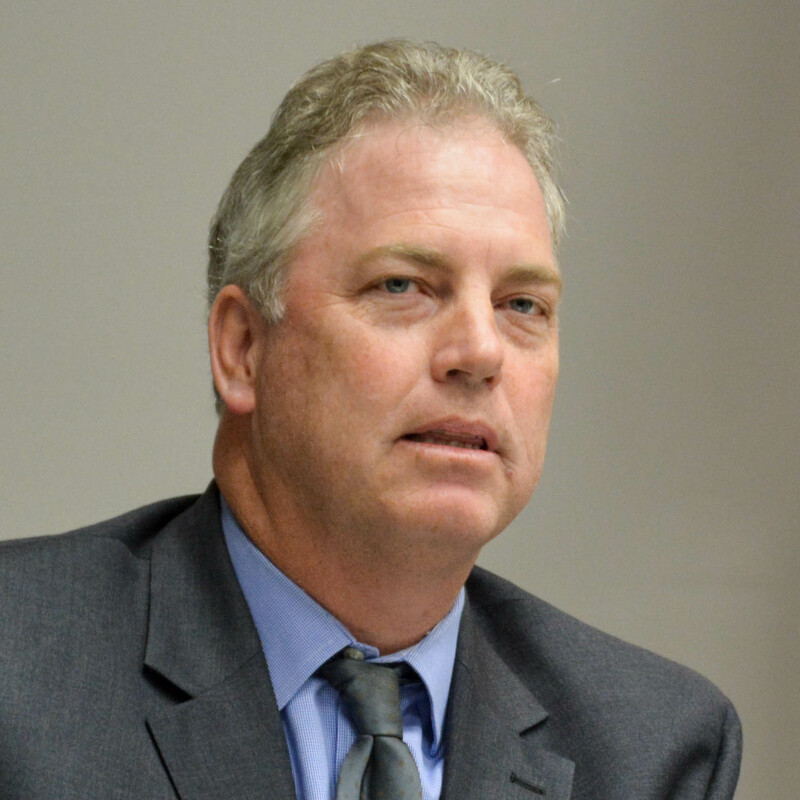 Lister’s opponent, Seat 3 incumbent Andy Zodrow, also asked for an end to the harassment campaigns that have plagued the town in recent years. “People are gonna argue, people are gonna have conflict,” Zodrow said. “That’s just the nature of politics and that’s not gonna go away. Seat 3 incumbent Andy Zodrow. Unfortunately, it appears the candidates’ pleas for peace weren’t received by everyone in town. During the Feb. 5 commission meeting, Zodrow reported that immediately following the forum, he was the subject of a smear campaign that didn’t originate from his camp. “It is campaign season, and there’s a lot of ‘stuff’ going on,” he said during his Commission Report. 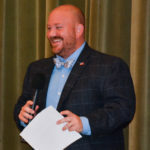 Zodrow went on to detail the social media firestorm that flared up over his stated desire for the city to purchase certain lots in the downtown district. 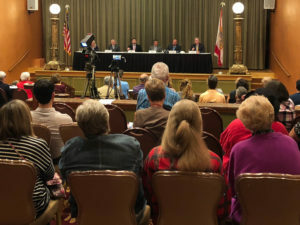 After clarifying he was talking about purchasing property to prevent the destruction of historic landmarks such as the Baranoff Oak, Zodrow explained that over the weekend following the forum, someone he “did not know” distributed leaflets disparaging his opponent, and he was subsequently accused of littering and violating campaign statutes. “That was very frustrating for me,” Zodrow said of the incident which saw papers containing incomplete quotes lifted from Lister’s forum answers about parking placed on windshields in town. Zodrow said he discussed the issue with Lister prior to the commission meeting, and he discouraged supporters from distributing information related to the campaign if it is not approved by the candidate. After the meeting, both Seat 3 candidates reiterated their desire to keep the remainder of the campaign season clean. 2018 Election Day is Tuesday, March 13. Commissioner Zodrow also responded via email Thursday. 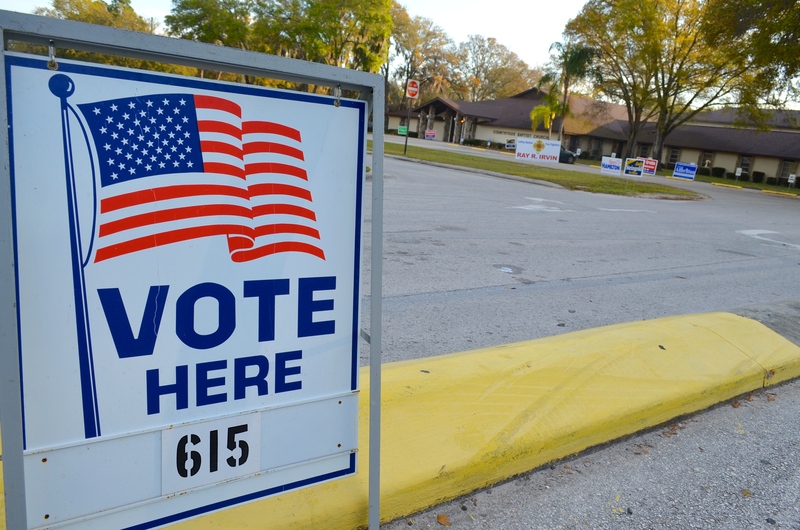 “It is unfortunate that such a very small group of people have been able to generate such a divisive and acrimonious election campaign in our great town of Safety Harbor,” he wrote. 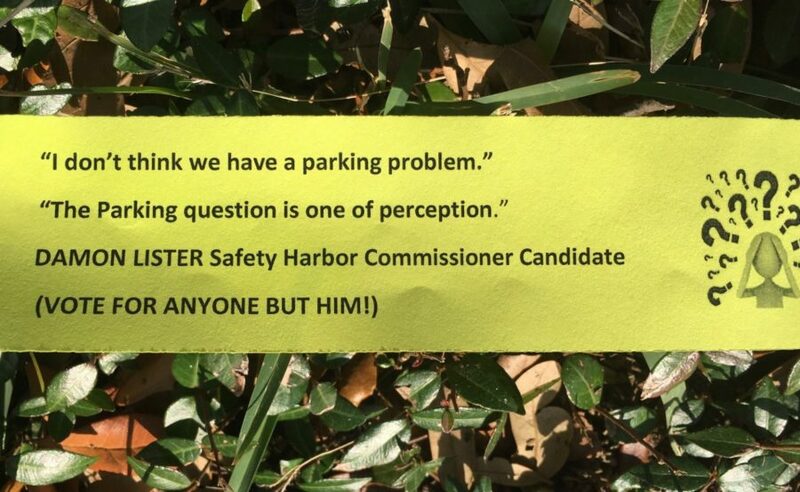 Everyone can draw their own conclusions – but Andy’s close friend Shelly Schellenberg posted this photo of an anonymous flyer she had printed and prepared that misrepresented Damon’s overall parking remarks at the candidate forum. It’s noteworthy in that this photo was uploaded a day BEFORE a similar flyer littered Main Street. It certainly gives the appearance that Andy’s close friend was helping to coordinate an anonymous leaflet drop over misrepresented parking comments. Again, draw your own conclusions BUT – Andy has been commenting and reading Saving Safety Harbor. How could he have missed this photo? He commented in the same overall thread! And incredibly, Mr Zodrow defended and endorsed that site (Saving Safety Harbor) on 2/7, after the flyer incident, and after that site referred to people as “skanky” on Feb 3rd. Is he really against negativity or trying to capitalize on it? How about a sitting commissioner who happens to be a lawyer sending a citizen a legal letter thru Facebook Messenger threatening to sue a voter?How would it make you feel if you spoke out against political flyers being posted on cars during the Big Damn Race that littered downtown and instead of “sorry that should not have happened” he sends you a legal letter threatening to file suit? Well it happened to me and I’ll share the letter below. .
On February 4, 2018, there was a public comment published on a public social media site “Paving Safety Harbor” Facebook page that was submitted by your Facebook account. No retraction of that post has been made and it is apparent that you drafted and published that comment on the public site. The published information accused me (Andrew Zodrow) of “littering” in downtown Safety Harbor. I first must say that I am not responsible for any “litter” that was identified in the comment. I have no knowledge as to who is responsible for the subject paper notes that were distributed in the town. In fact, the notes do not identify me as a responsible party. You appear to have no evidence that I was in any way responsible for the distribution of that material. NOTE: If you are sending a voting citizen a letter threatening to sue, please know how to correctly spell their name. I wanted to share with you something: you should Google “defamation and public officials” and “ slander and public officials” and “libel and public officials” – it’s next to impossible for him to win on those cases because he had put himself in the public realm. He knows that. Now you do, too. Here’s a little excerpt: in the context of defamation actions (libel and slander) as well as invasion of privacy, a public figure cannot succeed in a lawsuit on incorrect harmful statements in the United States unless there is proof that the writer or publisher acted with actual malice by knowing the falsity or by reckless disregard for the truth. The legal burden of proof in defamation actions is thus higher in the case of a public figure than in the case of an ordinary person. Its a shame that everything seemed to be going pretty well until Mr Zodrow’s supporters put out the flyer. That was the first shot of negativity across the bow. As a leader Mr Zodrow could have acknowledged it and publicly corrected the record for Mr Lister. Instead, Mr Zodrow decided to pocket the votes and then send a threatening letter of defamation to try to silence anyone speaking on the issue. This was not the second shot, this was a cannon ball. Those two events set the tone and course we are now on. Don’t reward these underhanded tricks with your vote. Damon Lister is a good man running a clean campaign and he did not deserve that. His honest and positive leadership is exactly what we need. Mr. Zodrow continues to make the same mis-steps that his supporters made in the last election. Believing that fear and untruths can win an election in a city small enough that truth actually matters. When he tries to scare people against mixed use buildings, he publicly claims new residents in town will let their dogs pee on the Baranoff. This is pure fear mongering, capitalizing on an emotional issue and creating completely false threats (unless the dogs have climbing gear to get over the metal fence). When he implies he has knowledge of people who would like to see the Baranoff cut down, or when he warns that his opponents may revise the code and begin building 7 story buildings in the surrounding residential areas, it is pure fabrication. It is fear mongering – untruths meant to prey on the most vulnerable or easily angered among us. Fear leads to anger and anger leads to the dysfunction and un-neighborly attacks that have become all too common in our town. No matter where you stand on any of the issues, this anger is not serving us. A sitting commissioner, presented with the fact that his supporters used underhanded tricks and lied about Mr. Lister’s positions, should have tried to make it right. That Mr. Zodrow would decide instead to threaten a lawsuit against someone’s post about litter, speaks volumes. Will he sue you if he doesn’t like what you say? The future of our community is too important to use cheap political games and slippery-slope arguments. You know who has NOT engaged in any of this? Damon Lister, a man of maturity, integrity fairness and, thank goodness, NOT a politician. He won’t engage in this because it just isn’t in his nature and his honest positivity is exactly what we need in Safety Harbor. Doesn’t Mr. Zodrow remember when a new neighbor, once excited to move to our town, broke down in tears in front of him at a commission meeting because of the relentless bullying and harassment intentionally incited by Ms. Schellenberg’s website, Saving Safety Harbor? Doesn’t he recall that, precisely because of this bullying, Ms. Schellenberg was brought in front of the commission TWICE for ethical issues before her and her husband resigned from boards to avoid removal? (you can find articles about the handling of these ethical issues on this website) Why would Mr. Zodrow publicly endorse this site and tie his campaign to this bully pulpit? I am afraid its because, like a true politician, he believes fear and anger will get him some votes, no matter what the cost to our community. I have met Damon Lister and I believe he knows better. He is committed to leading with positive energy and honesty. He will not condone, endorse or engage in underhanded political tricks even when some ill-gotten votes may be up for grabs. We need his fresh, fair and good-hearted leadership. While Damon Lister serves as a Deacon at his church, Andy Zodrow made a deal with the devil, turning his campaign over to Shelly Schellenberg, the disgraced former city code enforcement board member, who TWICE was called to City Hall on ethics charges. Schellenberg was the source of the half-truths, lies and nastiness that helped push last year’s election into the gutter. Yet, despite voters rejecting last year’s hate campaign by a 2-1 margin and electing Joe Ayoub as mayor, Zodrow showed no hesitancy in aligning himself with the group that was actually proud of leaving dog crap in new homes — to show their dislike for new residents. I do not agree with many of Andy Zodrow’s political stances, but I had always viewed him as an interesting and intelligent community voice who deserved to be heard. Now, he has lost the respect I once gave him. Sleep with dogs and you are going to get fleas. Zodrow turned his campaign over to the woman who has used lies, smears and intimidation to push her self-serving agenda. Her Facebook site makes vile and hurtful charges, then deletes opposing views and bands the poster. But now, here he is operating by Shelly’s playbook, dropping incorrect, fear-inducing comments that have caused residents to think the Baranoff Oak is about to be cut down, and seven-story developments are headed to Main Street. Damon Lister does not deserve this. He only wanted to run a positive campaign, selling himself instead of trying to tear others down. He is a good man — honest, principled, sincere and eager to represent all citizens. Even better, Damon IS NOT an attorney, so if you voice an opposing opinion, he will listen and will not send you a letter threading to sue. I am vehemently against the hatefulness promulgated by the Saving Safety Harbor Facebook people. That Andy Zodrow is so closely aligned with them is unfortunate for him. I expect better from an elected official. If there is a candidate who seriously listens to, respects and acts on public opinion offered at commission meetings, I say vote for her/him without hesitation. When delivering public comment based on truth, research and experience at commission meetings, I have been a recipient of the patronizing attitude and jokes from some of the current group sitting at the table. And as a 20-year resident who cares, I certainly won’t bother to waste my time exercising this futile option again to this same bunch. I agree, the condescending attitude has got to go. Long time or new residents should not be patronized by Zodrow. I remember the night our previous mayor in his infinite wisdom decided to scold an audience of citizens who spoke out against the commission and then code enforcement volunteer. Maybe he did this because maybe he felt he could being he was in a position of power. I along with other citizens of this fine city have been on the receiving end of Andy Zodrow’s condescending demeanor. Now Mr. Zodrow is trying to using his profession to instill fear in to a local citizen by threatening suit during a campaign for her speaking her mind. This was the culture of some of the previous commission leaders many of which are not holding those seats. This is not the type of culture that we need to represent our community nor does that type of culture fair well for our citizens. It is time to get a fresh face who respects our citizens and their input- good, bad or indifferent. Seat 3 should be a safe and comfortable seat for the people of Safety Harbor to address and turn to not one of condescension and fear mongering. Damon Lister will listen to all residents. When Mr Zodrow addressed the forum audience, speaking out against negativity and unfair campaigning, I really wanted to believed him. He said this in front of his supporters, including Ms Schellenberg of Saving Saving Harbor. Yet days later Ms Schellenberg posted pictures of the mis-quotes from Damon Lister. Then the flyers of these quotes were distributed. Then Mr Zodrow threatened to sue someone. Then Saving Safety Harbor called people skanky. Then Saving Safety Harbor and Mr Zodrow started fake hysteria online, fear mongering about the possibility of the Baranoff being cut down. Then Mr Zodrow posted an endorsement of Ms Schellenberg’s site Saving Safety Harbor, claiming we were vilifying it. REALLY? I could never have imagined all these shenanigans from one campaign, all in the same week. Haven’t we had enough. The resulting divisiveness hurts us all and Damon Lister has the maturity and positive energy to rise above these campaign tricks. When will Mr. Zodrow learn that once a project is approved it is a new neighbor’s home, not a political football. He posted on his official campaign website that the new homes, approved almost 15 years ago and now under construction by the marina will be a “disaster”. That is very disappointing and clearly contributes to the caustic atmosphere we have suffered. These sorts of poorly considered comments hold no constructive purpose, but they will precipitate a repeat performance of the sort of anger mongering we saw in the last election. Homeowners were harassed and bullied to the point of breaking by the carelessness of his and his supporter’s “no holds barred” rhetoric. We need leadership with the maturity and character to understand how to use rhetoric to heal rather than hurt. Damon Lister is the answer to this need. This Connect article has been distributed to many folks unsolicited. 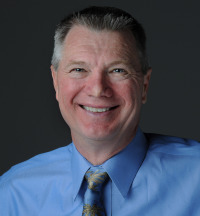 Connect is owned and run by Richard Blake, realtor and friend of the developers. Read with grain of salt. A few comments: Saying that Shelly “printed and prepared” the flyers placed under windshield wipers on cars. Total lie. She did not. Letter to Desanya Daly: she did not just “speak out” against these flyers. She actually accused candidate Zodrow of violating campaign statutes and littering! This after she ASSUMED he ok’d the distribution of these strips of paper. He knew nothing about it and he is correct in saying that accusing an individual of crimes is a serious matter. She owes him an apology. Accusations of scaring, fear mongering, false threats, pure fabrication, untruths, etc. Current mayor Ayoub promised in his literature that he would “lower the building heights on Main Street to 35′”. Had he followed through, his friend, Bay to Bay Joe Faw would not be building 2 buildings higher than 35′ now. If a commission and zoning board can lower heights, they can also raise heights! Zoning rules can change from one administration to the next. The warning was: be thoughtful who you vote for depending on which way you want to see the city go. Look at this Monday commission agenda, zoning change wording. Under “infill houses” in downtown, they are changing the wording by dropping the words “low density”. This came from the Zoning Board now headed by Vic Curti, “Smart” growth group founder in SH who wants more density. Camel’s nose under the tent folks. Be involved in who is on our boards. Don’t believe what these people post without checking it out. Half truths and outright lies are easy to fall for if you are willing. Sharon does not care that she blocks thtebsidealks with her snub nose garage. Everyone that has to walk around her car into the street should be taking pictures and calling code enforcement. To clarify, the Planning and Zoning Board has five appointed members and an appointed alternate, all of which discuss and deliberate items on the meeting agenda. All members have an equal voice and vote on their recommendations to the City Commission. When I have attended meetings over the past year or so, I observed a very capable woman serving as the P&Z leader (chair), not the person the commentor above falsely called out. The commentor is only contributing to more of her group’s false narratives and fear mongering by singling out one volunteer board member (and by name no less) as having inordinate influence on the process. Simply not true. Attend P&Z meetings and see for yourselves. I moved to Safety Harbor to open a business on Main Street, under the assumption that trying to make a living is a fair, common denomenator amonst people, no matter where they reside. During the last ugly campaign, for suggesting I supported more vitality on Main Street, I was accused, on Ms. Shellenberg’s Saving Safety Harbor Facebook page, of being a heartless profiteer who was only looking out for myself and only in it for the money. I was then blocked from the site for trying to explain, in an eloquent, fair and ADULT fashion, that I am, just like all of us, trying to support myself and my family by doing something I love and offering a service. Their style of attack harms my ability to make a living. That is why it is so troubling to learn that Mr. Zodrow has endorsed and aligned himself with this site. Hopefully people will see past his efforts to whitewash her and her un-neighborly site. And he really should take a look in the mirror. I believe very firmly that you can tell an awful lot about a person by the way he talks to and treats others. He will not be receiving my vote, not when there are kind, fair, non-judgemental folks like Scott Long, Damon Lister, and Cliff Merz trying to garner trust and to actually HELP the community instead of just finding ways to turn people against each other. i just learned that Commissioner Cliff Merz has taken down all his campaign signs that were placed along side those of any other candidate. I applaud Mr. Merz for taking a stand and refusing to be Used as a tool by Shelly Schelllenberg’s group, attempting to divide our commmunnity even more,by now pitting commissioners against voters. Is there no act beneith their level of didgnity? Sad. Sad. Sad. But welll played by Mr. Merz for not fallling into her trap. No one else should, either. I really don’t think your above comments are completely fair, and here is why. My post is not directed at anyone individual, but to all of us, because we are the ones that can stop the madness. I am not condoning anyone’s actions, but I must ask you this. Why do you assume Cliff’s signs were removed because of Shelley? I believe he removed signs so he was aligned with only himself, not Smart Growth, not SSH, not any other candidate, or any other group, or individual. I say good for him. It makes me respect him even more. Why would he want to get tangled up in the fray? I understand exactly why Cliff is doing it his way and I don’t blame him. However, I had a sign of his in my yard for no other reason that I support him 100%, and always have. There was no hidden agenda, I just like Cliff, for many reasons. Now, through no fault of my own, I can no longer show my support for him because of the hostile environment created in this town. Most certainly I am not the only one affected by this. To lump all of us in one category is unfair. I have stayed completely out of this year‘s election campaigns, and am only putting signs in my yard to show support. Let’s face it, both sides have their antagonists who throw ‘crap’ out there, many times unbeknownst to the candidates. Once the happens, a firestorm is created because folks jump on the bandwagon, fanning the fire and making the situation worse. Both sides, all sides, not just one side. I believe both Scott and Andy have had this happen to them through no fault of their own. Scott with the images and a FB page, and Andy with the fliers. I feel certain Scott didn’t support those those images, (and took swift action to shut it down), any more than Andy distributed those flyers and littered. I don’t believe either of those two incidents should have happened, but once they did, they took on a life of their own. Sadly, the supporters react and begin posting only making matters worse. I was so hoping we could get through this campaign season peacefully, allowing our candidates to just run, without any interference from the peanut gallery. I think, we the supporters, are the ones that create all the negativity by continuing to post on social media when something unfortunate happens. Sadly, we haven’t found a peaceful, non harmful way to iron out our differences. I don’t agree with the fliers, or the ‘cartoons’ that were posted, or any other actions that do not reflect the candidates in a positive manner. We should no longer continue to perpetuate the cycle of hatred and negativity or tolerate those that do. Commissioner Diaz was adamant and passionate when addressing these issues, and I for one, support and applaud him. It needs to stop, and we are the only ones that can do that. I hope everyone understands what I am trying to say without coming back at me with meanness or negativity, because my intention is not to wreak any more havoc, only point out that we are the only ones that can put an end to all the nastiness. I don’t think it has to be this way. Agree we had Merz’s sign up because we support him 100% and still do. Truly thought this campaign was going to be smooth and calm and then the flyers were posted and peace was broken. Let’s hope the next 2 years of campaigning reprieve will heal the minds and souls of the community. Safety Harbor deserves more. I hope so too! No more flyers or cartoons. Holy cow, we agree on something, how about that? Maybe we can start a peace movement Desanya. I’m happy to work with you on this! 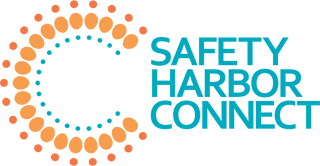 A positive peace movement:) Safety Harbor can become the lead example of how a small community can come together with their differences and be respectful of each other! Enough! Stop with the pettiness and personal attacks on residents and candidates for Safety Harbor Commission, who all are generous enough to step up to serve our community. We must be better at showing civility and respect for differing views. This is the proper democratic process. Stick with the issues, everyone. Please, respectfully debate the candidates’ platforms, not their personalities. Zodrow has spent more time talking about his opponents than his platform. I appreciate Commissioner Merz controlling his own campaign his own way. Even by taking his signs back, it makes my vote for him stronger. You won me over with your answers at the forum and this seals the deal. Thank you for standing up for what you believe is the right thing to do. Peace in the Harbor, what a great idea!!! I strongly endorse Damon Lister and will be encouraging anyone I speak with to vote for him. He is a good man and dedicated to Safety Harbor.